It's that time again! I need to do a wrap-up post for my 2017 Reading Challenges (which were very successful if I do say so myself) and I will. BUT today, I want to share what I've taken on for this year. 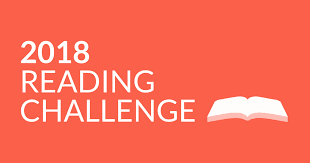 I've chosen the 2018 Goodreads Reading Challenge and for ONCE that's the only challenge I'm going with this year--maybe a bit of a let down--but ehh. I've chosen to read 60 books which is better than last years 45, but a far cry from 100 books read from past years. It is what it is. I'm accepting it. I'm only doing one reading challenge because I already know that this year is the year of FLUFF. The fluffier the better! I've been reading a lot of dark YA lately and I just don't want to do that right now. I'm probably going to continue to listen to YA Science Fiction and Fantasy and read more romance and mystery as long as it is fluffy. Good luck everyone! Be sure to tell me what you are doing about challenges in 2018. Are you challenging yourself to do something new? Or are you done with the pressure that challenges sometimes bring? I can't wait to recap my 2017 challenge where I read all of the books that were nominated for the Goodreads Choice Awards for 2016 and give you guys my final opinion. It was fun and different than anything I've done. But it did drag a bit at times. Look for later posts for my final reviews and thoughts!